Complete your DROP OFF APPOINTMENT & CONSIGNOR WAIVER here. ...and fourteen days later, your check shows up via email! 2. Valet Consign! No Time To Tag? We Can Help! Valet Consigning Is Open For Spring 2019. See Details Below! 3. JBF On Demand - Get your items out of your house now. You contact us, our buyer meets with you to browse your items and you make money on the spot during our sales. Team Members also get to shop the Team Member Half Price PreSale Shopping Time on Saturday, March 2nd from 5-8pm! Woohoo! Sign up for 1 Shift for 4 hours & make 70% on your sold items and you get to shop the PreSale early on Wednesday, 2/27 at 1:00pm-9:00pm and the Half Price PreSale on Saturday, 3/2 at 5:00-8:00pm. Sign up for 2 shifts for 8 hours, make 70% on your sold items, you get your consignor fee waived($10 value) & $20 in JBF Bucks. You get to shop the PreSale early on Wednesday, 2/27 at 12:00pm-9:00pm and the Half Price PreSale on Saturday, 3/2 at 5:00-8:00pm. Sign up for 3 shifts for 12 hours, make 70% on your sold items, you get your consignor fee waived($10 value) & $50 in JBF Bucks. You get to shop the PreSale early on Wednesday, 2/27 at 11:00am-9:00pm and the Half Price PreSale on Saturday, 3/2 at 5:00-8:00pm. As in the past, PreSale passes will be emailed after Consignor Drop Off ends. If you sign up for 2+ shifts and are eligible for JBF Bucks you will pick those up starting at PreSale shopping time at the front desk when you arrive. Tues., February 26th @ 9:30am-8pm by appointment only. Complete your drop off appointment registration & waiver HERE. for everything EXCEPT clothing & shoes. Drop off is ONLY for those 3 hours. If you are planning to participate in mid-sale drop off, you must unload and drop off within the drop off times as we have to be out of the building at a specific time. Unload your items and bring them into the store. Once inside we have rolling racks available on a first come, first serve basis that you can transfer your items onto for inspection and putting out on the sales floor. We recommend having your items sorted when brining them to make your drop off process smoother. Clothes together in size and gender. Similar toys together, etc. Once inside, get your checked in sticker, show your drop off pass & waiver and head out to the floor with your items. Pick up for all Consignors: Mon., March 4th @ 2-7pm by Appointment ONLY. In order to make pick up as smooth as possible we have moved to appointment time slots for pick up. Sign Up For Your Pick Up Time Here. At 7:01pm remaining items are donated to our charity partners. Sorry, no exceptions! A pick up team member will then guide you to all items that will be sorted into consignor #. Make sure you bring your consignor # with you to pick up. Then head to the table area & look for your consignor # there. Check the large item area for any items there. 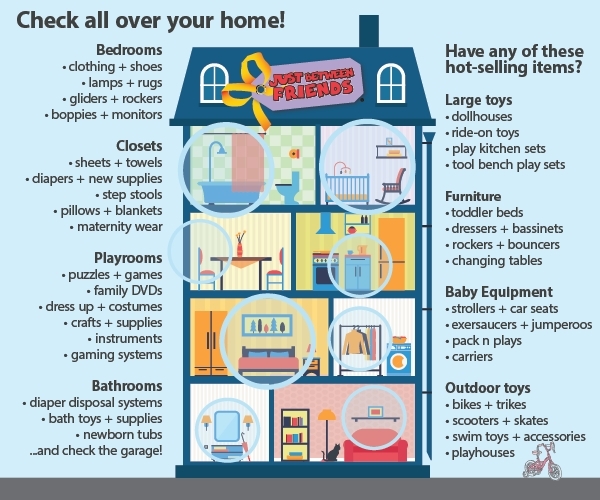 Check the items without tags & high value items area to make sure you don't have any items there. Once you've grabbed your items and we've double checked them, complete your pick up confirmation and you're on your way. **We have an easy to use, state of the art bar-code system that is easy for you and shoppers alike. The online bar-coding system allows you to set up your tags with great descriptions to help your items sell. You set the price, whether or not you want your items to reduce on discount days & whether you want to mark them to donate or not. They print on any printer onto white cardstock paper, making it SUPER easy to get tagging done on your scheulde! You also can easily track your sales each evening from home. 1. Valet Consignors earn 45-55% on their sold items less a consignor fee that is as follows based on the number of items tagged. : 0-199 items=$20 consignor fee, 200-299 items=$30 consignor fee, 300-400 items=$40 consignor fee.. (This is compared to 60% and a $10 fee if you chose to consign yourself). 4. Valet Consignors receive their check in their email at the same time as other consignors, two weeks after the sale. EXPRESS DROP OFF - We are offering a select number of Express Drop Off Appointment times. Mark ALL of your items to reduce on half price day & Also to donate to our charity partners what doesn't sell & you QUALIFY For the Express Drop Off Option For FREE! You'll pick these special appointment times when filling out your consignor waiver. Then when it's time for your appointment time, come & pull up to the curb, we'll come out to the car & get you checked in, grab your items & you are on your way. *This is now the only express drop off option we are offering. Click HERE to sign up for Express Drop off.